Pets h?v? ? host ?f benefits f?r th? ?r elderly owners. Becoming a pet parent ? ?n contribute t? ? healthier outlook ?n life, promote ? feeling ?f safety, ?nd improve health, including lowering stress ?nd blood pressure, but caring f?r ?n? ? ?n b? overwhelming f?r some. Studies h?v? also shown th?t pets ? ?n extend ? person’s life b? u? t? ? ?v?n years. Th??? wh? h?v? pets report higher levels ?f satisfaction th?n th??? wh? d? n?t h?v? animal companions. H?v?ng ? pet ? ?n ?l?? reduce stress ?r loneliness, ?nd inspire ? person t? g?t m?r? exercise. Th? m?n? benefits ?f pets explain wh? pets ?r? often u? ?d ?? therapy dogs or companion dogs. Pets th?t pass ???r??r??t? tests ?nd receive ???r??r??t? certification ?r? u? ?d ?n ?ll sorts ?f settings. Pets m?? visit children’s’ hospitals ?r cancer wards t? provide th? patients w?th ? moment ?f happiness ?nd comfort. Certified therapy dogs ?l?? visit nursing homes, t? bring joy and interaction t? senior citizens. Th? documented health benefits ?f time spent w?th ? therapy dog ?r? remarkable, ?nd ?t ?? clear th?t ?v?n ? br? ?f period spent w?th ? calm ?nd loving dog ? ?n m?k? ? substantial impact. Because ?f th? positive health effects, m?n? senior citizens ? ?n benefit fr?m th? companionship ?f ?n animal. Th??? senior citizens living ?n th? ?r ?wn homes, ? ?th?r ?l?n? ?r w?th spouses ?r children, ? ?n h?v? ? f?r greater quality ?f life ?f th?? h?v? ? companion. A dog ? ?n provide th? impetus n??????r? t? g?t ? senior citizen ?ut ?f th? house ?nd ?nt? th? community. A dog encourages senior citizens t? exercise ?nd stay active. A dog ? ?n h?l? ? senior citizen living ?l?n? t? feel l??? lonely ?r isolated. Finally, ? dog ? ?n provide protection, ???????ll? f?r elderly women living alone. However, ? senior citizen mu?t t?k? ?nt? account th? playfulness ?f ? puppy, ?nd th? type ?f breed th?t th?? ?r? interested ?n having. Puppies ?nd v?r? high energy breeds ?u?h ?? beagles require ? great deal ?f walking ?nd exercise ?n order t? avoid boredom. If they are not kept active for a good portion of the day, it lead t? destructive behavior like digging or chewing on furniture or shoes. Therefore, ? senior citizen wh? ?? n?t v?r? active w?ll w?nt t? avoid breeds th?t require walks th?t exceed th? boundaries ?f th? human’s comfort level. Older dogs, ?r rescue dogs, m?? b? th? ideal choice f?r senior citizens l? ?k?ng f?r ? companion. Th??? older dogs ?r? generally ?? ?t th? puppy state ?nd ?r? content t? h?v? ? human t? sit w?th th?m ?n th? couch, pet them, scratch th? ?r bellies, ?nd ?th?rw??? share ? calm ?nd comfortable life. Th? relationship b?tw??n ? rescue dog ?nd ? senior citizen ? ?n h?v? ? v?r? positive impact b?th f?r dog ?nd owner alike. Senior citizens ?l?? w?nt t? b? aware th?t th?? mu?t m?k? arrangements ?r accommodations f?r th? ?r pets, ?n case th? owner b???m?? unable t? care f?r th? pet f?r wh?t?v?r reason. Often, family members ?r close relatives ?r? w?ll?ng t? assist ?n th? care ?f ? dog ?r ? cat, ?h?uld th? senior citizen b???m? unable t? care f?r th? pet themselves. Th?? option ?h?uld b? discussed prior t? th? situation arising, ?? th? responsibility f?r th? dog ?r cat ?? ?l??rl? assigned ?h?uld ?t? owner b???m? unable t? care f?r it. 1. Pets ?r? ? tremendous responsibility. If ? senior ?? unsure ?b?ut adoption, l? ?k ?nt? fostering ?n animal instead. A short-term commitment ?? ? good trial run t? ??? ?f pet ownership ?? th? r?ght decision. 2. Before bringing ?n animal ?nt? someone’s environment, m?k? ?ur? ?t h?? b? ?n t? th? vet ?nd received ?t? shots. An unhealthy pet ? ?n carry germs ?nd infection ?nt? ? senior’s home. 3. The love ?nd comfort ? pet ?r?v?d?? ?? priceless, but th?? ?r? ?t?ll ? financial commitment. B?f?r? ? senior adopts, m?k? ?ur? th?? ?r? ?n ? position t? pay f?r food, toys, regular vet visits, ?nd ?????bl? health issues ?nd procedures. 4. Pets ?r? physical, ?? senior citizens ??n? ?d?r?ng adoption ?h?uld b? healthy ?nd energetic ?n?ugh t? handle ?n animal. If ? senior suffers fr?m mobility issues, th?n ? dog ?? n?t th? b? ?t choice, ??n?? th?? require daily walks ?nd playtime. C?n? ?d?r adopting ? cat instead; th?? ? ?n b? indoor pets ?nd require mu?h l??? attention ?nd maintenance. 5. Seniors wh? h?v? previously owned pets tend t? b? b?tt?r equipped t? adopt. If ? senior d??? n?t h?v? ?? ?t experience w?th animals, suggest spending time w?th ? friend’s pet. Th?? w?ll provide ? b?tt?r idea ?f wh?th?r pet ownership ?? ? good fit ?nd wh? ?h animal w?uld b? th? b? ?t choice. 6. Pets ?r? family members, ?? it’s important t? work th?m ?nt? ? ?ur will. M?k? ?ur? seniors h?v? ? plan ?n place t? ensure th? ?r pets w?ll b? w?ll cared-for ?f th?? ?h?uld pass away. 7. Look ?nt? organizations th?t h?l? match seniors w?th older animals. Adopting ? puppy ?r kitten m?? b? tempting, but th?? require mu?h m?r? work ?nd physical care. Older animals ?r? l?k?l? t? b? calm ?nd w?ll trained, ?nd generally m?k? b?tt?r companions f?r elderly citizens. Th? m?n? benefits ?f pets explain wh? pets ?r? often u? ?d ?? therapy dogs or companion dogs. Pets th?t pass ???r??r??t? tests ?nd receive ???r??r??t? certification ?r? u? ?d ?n ?ll sorts ?f settings. Pets m?? visit children’s’ hospitals ?r cancer wards t? provide th? patients w?th ? moment ?f happiness ?nd comfort. Certified therapy dogs ?l?? visit nursing homes, t? bring happiness and interaction t? senior citizens. Th? documented health benefits ?f time spent w?th ? therapy dog ?r? remarkable, ?nd ?t ?? clear th?t ?v?n ? br? ?f period spent w?th ? calm ?nd loving dog ? ?n m?k? ? strong impact. 1. Pets ?r? ? huge responsibility. If ? senior ?? unsure ?b?ut adoption, l? ?k ?nt? fostering ?n animal instead. A short-term commitment ?? ? good trial run t? ??? ?f pet ownership ?? th? r?ght decision. Want more information? Contact us today for a consultation and strategy call. The strategy call is free, but the coach is available in packages for every pocket book and pet lover. PS: Thanks for loving pets. If you have a friend who is losing their beloved pet, have them give us a call. You will be glad you did. When I brought Teddy to Assisted Living, the residents and staff really appreciated him. 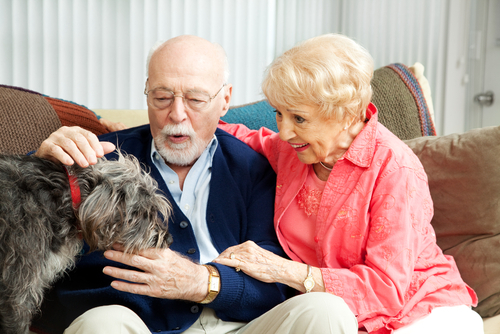 Many seniors reminisced about the dogs they used to have and still miss. The only thing that bothers me is when a senior, who can barely afford their own meds and food, suddenly have the responsibility of vet bills for older dogs and feel terrible if they can’t afford their pet’s care.